This is the fourth in the Rick Cahill P.I. series and, for me, the most emotionally-charged. Rick investigates two cases, both involving loved ones, so already, you know there’s a lot at stake. One case involves Kim, his ex-girlfriend, who hires Rick to confirm her suspicions that her husband is having an affair. The other dredges up Rick’s long-suppressed shame of his deceased father, a disgraced cop, when a safe is discovered in his childhood home. The two storylines weave together flawlessly. Kim’s case takes Rick into shady real estate deals and, eventually, murder. His personal crusade to uncover the truth about his father leads to a 20-year-old cold case. Rick struggles between his need to see justice served and the fear of what he’ll discover about his own flesh and blood. Coyle skillfully breaks up the thrilling action with more introspective moments, resulting in a topnotch read. A hard-boiled PI novel for fans of Raymond Chandler, Ross MacDonald, and Dashiell Hammett. 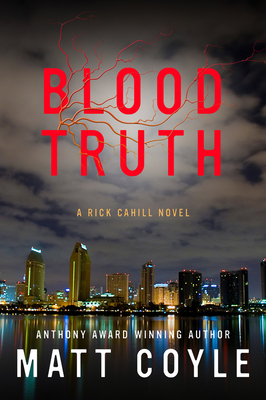 Rick Cahill has long feared the truth about his own blood--the blood of his father coursing through his veins. When a long-hidden safe unlocks clues about why his father was kicked off the police force twenty-seven years ago and then spiraled into an early drunken death, Rick determines to find the truth even if it proves the one thing he's always feared. But as he grapples with his father's past, the woman he still loves pleads with him to find out if her husband is having an affair--or is involved in something much more sinister. Could the truth send her back into Rick's arms? Would he have a last shot at happiness? He may never get the chance to find out, as killers who will do anything to protect their secrets lurk in the shadows.